What: Robin Hood and his band of merry men will fly through the forest via zip line in this immersive, all-ages outdoor play. What: Meet real robots, learn more about artificial intelligence, see demonstrations from local robotics groups, and work on robot-themed crafts at Fernbank’s STEM-focused day. What: The Center for Puppetry Arts screens the 2009 Spike Jonze film, which is based on Maurice Sendak’s darkly fanciful children’s book about a naughty boy who is taken in by a group of terrible beasts. What: This annual arts event draws a (huge) all-ages crowd, but special events for little ones include a Tot Trot (race for children 7 and under) and KidsFest featuring crafts and games. What: Watch as butterflies are released and take flight, wait for a Painted Lady to land on your shoulder in the encounter tent, enjoy live kid-friendly music and face painting, and slurp up a King of Pops treat at this annual event. What: Roswell’s annual series features a different puppet show every week, including familiar tales like Rumpelstiltzken, Robin Hood, Beauty and the Beast, and Pinocchio. What: Atlanta’s Lyric Theatre stages a play based on the Disney animated film. What: Now in its fourth year, this weeklong fest celebrates the two-wheeler experience and includes special themed bike rides, classes, parties, even a bike yard sale. Last year drew more than 3,300 riders of all ages. What: Be among the first to see this world-premiere play based on the book by Newberry-winning children’s book author Ashley Bryan, whose work is also featured in a special exhibition at the High Museum. The musical will be performed at three different locations in the metro area: Oglethorpe University, The Galloway School, and Spelman College. What: Explore this multi-sensory, interactive exhibition focused on sound, science, and art. Play sand drums, “tube phones,” and instruments made out of PVC pipes, then screen a unique Blue Man Group performance in the surround sound theater. 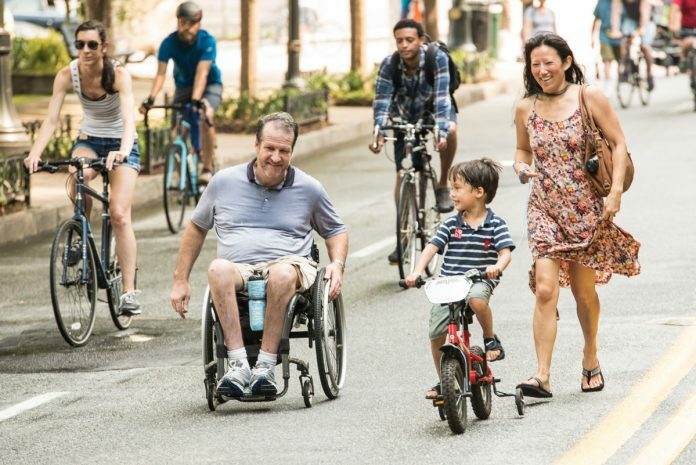 What: Take a stroll or bike ride along this brand-new, car-free route from Streets Alive, timed to coincide with the Atlanta Cycling Festival. What: Sixty tons of sand transform the Decatur Square into a beach setting perfect for castle-building, fruity drinks, funnel cakes, and live music and dancing. New this year: Pop-up performances from stilt walkers, fire twirlers, and more. What: Since slavery was abolished in 1865, Juneteenth has been celebrated to mark the anniversary of the event. At Oakland Cemetery, take a guided walking tour of the African American burial grounds (including a special kids walking tour) and participate in a cultural scavenger hunt (also for kids). What: Aurora Theatre presents a free, open-air performance of this musical by Lin Manuel-Miranda (yep, the Hamilton guy), which recently won three Suzi Bass Awards for its staging last fall by Aurora and Theatrical Outfit. What: The History Center celebrates Juneteenth with a free admission day. Show up for immersive theater performances, special activities that explore themes of history and freedom, and crafts. What: What’s the difference between a mammoth and a mastodon? What other giant animals did they live among? What did their fur feel like, and how big were their teeth? Explore these Ice Age creatures in Fernbank’s interactive exhibition, then head to the giant screen to watch Titans of the Ice Age. What: This high-flying show fuses fairy tales, magic, circus arts, and puppetry. For ages 4 and up. What: AthFest, an annual arts and music festival in downtown Athens, also welcomes little ones to KidsFest. Watch kid-friendly bands (including middle- and high-school music acts), work on arts and crafts projects, cut loose in a bounce house, and more. What: Camp under the stars at Chattahoochee Nature Center. You’ll go on a guided night hike, see a rehabilitated animal up close, and roast marshmallows by the campfire. What: The High Museum hosts another outdoor exhibition of whimsical work by sculptor Jaime Hayon, who created last year’s TioVio. This time his large-scale, colorful creations double as spinning merry-go-rounds, so kids can hop on or give them a whirl.